Restaurant Brother Yat, Subang Jaya: Sensational Sensory Cuisine! Our next makan trip had me searching in circles for Restaurant Brother Yat! Food hunting can be quite fun… hehehe. We were recommended by another foodie that there are a few special dishes we should check out at Brother Yap who has been around for more than five years. I like the name of the restaurant. It reminds me of some mafia movie with a name like ‘Yat Kor’ in Cantonese. I finally located the restaurant in an obscured industrial area in USJ near the infamous Giant hypermarket. The restaurant ambience fits the name with its rustic and no frill décor. Minimal décor but brightly lighted with spacious basic table settings with red cloth, Brother Yat also has some live seafood tank at one corner on the restaurant. The place is airy despite it being al fresco as there are plenty of fans and the high ceiling helps. Brother Yat caters towards the industrial factory crowd during the daytime, hence one may not know of its existence unless you are told or recommended by someone or you work close by! Don’t let the exterior fool you as Brother Yat serve up a few unique dishes that is worth checking out. Isn’t this a glorious sight? The crustaceans look almost surreal with its bright red color and check out the hot stones beneath it. 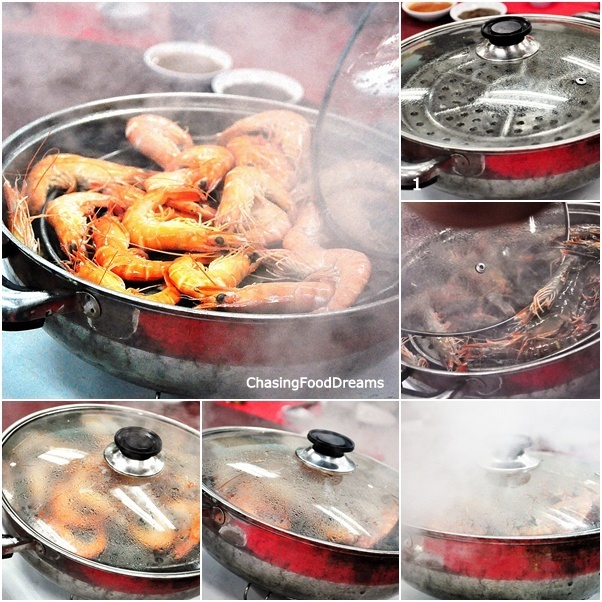 We were told that these are river stones heated to high temperature so that it only takes a few minutes to steam cook the live prawns simulating the sauna ambience! Claypot Sea Garoupa or ‘Sang Poh Hoi Pan Yue’ (RM8 per 100 gm) arrives in an old fashioned claypot. As soon as the lid was lifted, a fragrant soy sauce aroma lifted across the table. The fish pieces were accompanied by loads of garlic, ginger, and scallions all simmering in supreme soy sauce. This dish is quite ordinary for me but I love the sauce as I keep flooding my rice with this gravy. To porcine lovers, the next dish of German Pork Knuckle with Mongolian Sauce (RM45) is a must-try! What’s not to like? Super crispy pork knuckle well marbled with its natural fats was irresistible with the peppery Mongolian sauce. The dark meat was delicious enough to eat on its own but the sauce really makes this dish more unique. The sauce shares a similarity to American BBQ sauce but was fusion with more Asian flavors to cater to our local taste buds. Needless to say, we chomped on this till it was super clean! The pork knuckle was accompanied by this Pickled Vegetables to offset the fats and I was glad the owner thought of this. It was nice to cleanse our palate with this pickled vegetable. Check out the young owner happily hacking the pork knuckle with scissors. Such glee can only be seen in passionate people who are serious about their enjoyment… hehehe! I have to rave about this next dish of Smoked Village Chicken with Tea (RM26 half, RM52 whole). We were presented with the lovely evenly tan chook sitting nicely on the platter. The chicken was first steamed and then followed by smoking session for its golden tan and to flavor it. It looks quite normal but wait till you taste it! The chicken was returned to the kitchen to be chopped up into bite size pieces and came back looking gorgeously divine in its colorful presentation. The aroma of smokiness with ‘Pu Er’ tea in the chicken is what makes me ramble enthusiastically about this dish! The chook has a deep flavor and coupled in its own essence elevated the dish to another level. As it was village chicken, the texture was firm and I could taste the chicken flavors in the meat itself. I ate so many pieces of this bird that night! If you had read my other post, you would know I am not really a frog fan. Maybe it’s the slimy and ugliness thoughts at the amphibian itself that really puts me off. I would try it but only a small piece. Bamboo Steamed Frog or ‘Lung Chai Tin Kai’ (RM40 per kg) was presented in a bamboo basket lined with foil. The pieces of frog were steamed with dried lily flowers, ginger and black wood ear fungus with hint of wine. Not too bad as the flavors was sufficient and the frog meat was sweet and fresh. Look at the layers of the sinful pork… how to resist? The lovely thick sauce glazing the pork had me drooling while writing this post. Hunan Ostrich (RM16 small) was a myriad of colors. Pieces of ostrich stir fried with bell peppers and onions in a Hunan sauce was a little spicy and had a deep intense flavor of a dark brown sauce. Average for me as I thought the meat could be a bit more tender but no complaints from others as they finished this off with gusto! Can you figure out what this is? I was told it’s called ‘Suet Lin Guo’ and belongs to the root vegetable family. It shares the look of a yam or sweet potato but taste and textures are really the opposite of them both. Let me know if you know the english name for this vegetable. ‘Suet Lin Guo’ (RM 12 small) is stir fried with a medley of carrots, snow peas, corn and almond flakes. The texture had me at surprise as it tasted like across between a jicama or sengkuang and celery. It has a lending sweetness against its almost crunchy texture which I quite like. This is certainly a first for me and I don’t mind ordering this again. Restaurant Brother Yat was a pleasant discovery for me. I love their unique dishes and they do play around with all the senses of sight, sound, touch, taste and smell! For a simple hidden restaurant like this, I have to give the young owner a great deal of credit for being so creative in his dishes and presentation! Portions are a good size and the quality is great. Price is also fair for simple dishes and freshness is truly detected here. *Please call for reservations for some dishes. 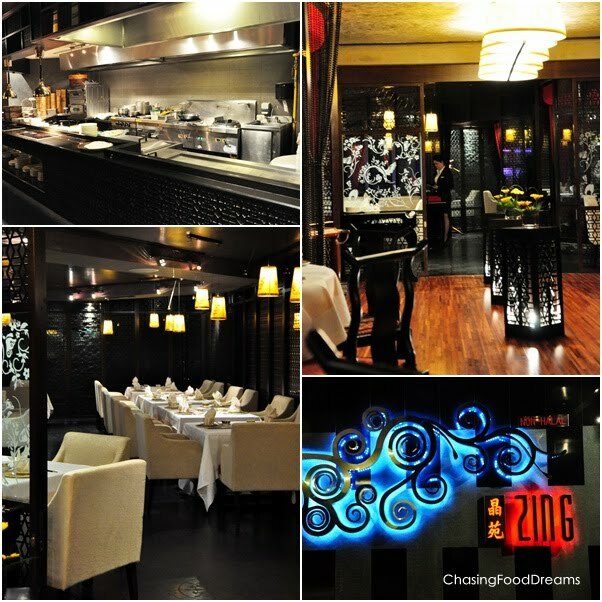 Zing, Grand Millennium KL: A Chinese Six Course Meal Deal with Groupon! Recently, I have been dining in style! Guess what… you can too! Watch out for an Unbelievable Deal coming this week from Groupon Malaysia with Zing, Grand Millennium. For a limited time only, you can dine with grandeur at Zing (non-halal), Grand Millennium Kuala Lumpur’s signature Chinese Restaurant that specializes in authentic Cantonese cuisine with light, creative oriental menu. The restaurant’s interior reminds me of Shanghai in the 30s with not an oppressive dose of the traditional elements. Zing also places a strong emphasis on the daily Dim Sum made live on the open kitchen led by their award winning Chef Leong WH. The restaurant, which seats 110, also has nine elegant private rooms with discreet entrances and additional amenities such as exquisite custom-designed flatware and dishes. The interior is packed with contemporary dialogue cream-colored armchairs and long, curved settees with comfortable cushions. Zing is simply out-of-this-world classy and elegant. It also features a Dim Sum station open concept to tempt your appetite! Raised by a family with a passion for Chinese, Chef Leong started his career at Chan Kee Hakka Restaurant as a cook and was inspired by many great chefs along his 20 years of career. After working at the Hotel Merlin for four years, Chef Leong joined Zing, serving Northern and Western Chinese cuisine from the heart of Kuala Lumpur. With an innate fascination and passion for food, Chef Leong’s outlook fits perfectly with the ideology and concept of what makes Zing unique. Chef Leong fired up his wok and we were treated for a live presentation of our lovely course meal! Gorgeous soft shell crabs being treated to a bubbly oil bath! Assistance Chef at work with such artistic and pristine gestures and actions. Salad Wanton was stuffed with fresh prawns and dressed with a salad cream. Kung Pao Chicken was perfectly executed as the chicken was evenly coated with the Kung Pao creamy dark sauce with a hint of dried chili. Fresh Squid Stir Fried in X.O. Sauce was nice as it was full of taste and textures. Last but not least, Deep Fried Soft Shell Crab was deliriously yummy with its crispy batter but soft inside. I could defiantly have a few rounds of this platter… hehehe. 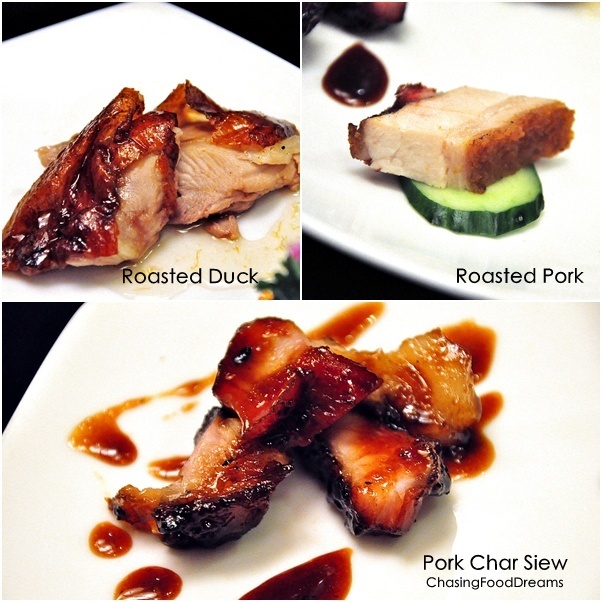 Our next dish was a Trio Roasted Meat Platter which consists of Roasted Duck, Roasted Pork Belly and Honey Barbequed Pork Char Siew. My favorite was the duck and Char Siew. Both had deep intense flavors and was so enticing. Pork belly was average. A luxurious Stewed Soon Hock Fish with Bean Puff and Whole Garlic was subtle and sweet. The fish was fresh and a good size. A simple but well controlled dish by Chef Leong. The next one dish of Braised Homemade Bean Curd with Stir Fried Scallop and garden greens was another beloved dish of mine! The house made bean curd was smooth and eggy while the scallop was nicely seared. The overall execution was again subtle and luxuriously put together. Our fifth course was the chef’s special Stir Fried Egg Noodles with Shredded Honey Barbecue Pork and Soy Sauce. Nice wok hei as I caught the chef stir frying this with such gusto and huge flame. We ended our six course meal with a classic Sweetened Potato Soup with Sesame Glutinous Rice Dumpling. Everyone at my table loved the gingery soup with the dumplings as it was so comforting to the tummy. What a way to end the meal… sigh with content. 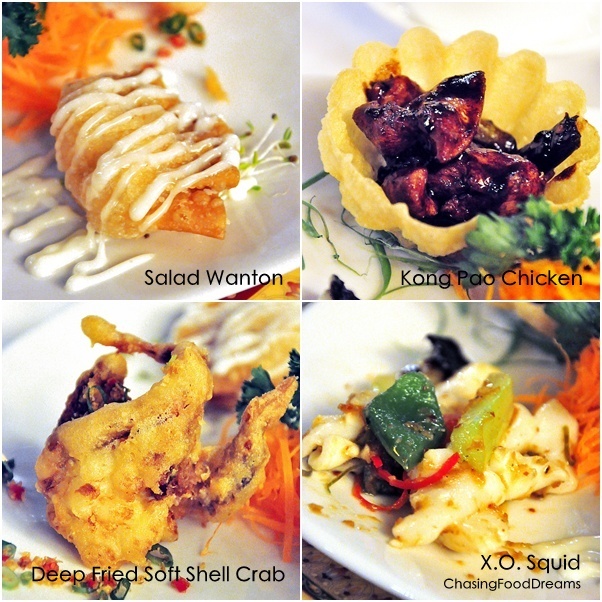 This six course meal would have cost quite a bit on normal days but if you check out this Monday, 30th May, 2011 at the following Groupon Malaysia website, you are sure in for a great deal at only RM39.00 nett! Hurry, the deal is only valid for three days or till the allocated coupon is sold out!! Redemption begins Jun 4, 2011. May buy and use many. Valid for dinner dine-ins only. Minimum 2 Groupons per table. Maximum 10 Groupons per table. Service charges and Government tax included. Children aged 6 and above require a Groupon. 2 days prior reservation required. Last date for reservation: Sep 2, 2011. *Term and condition applies. Please refer to Groupon website for more details. Zing is also having their house made Rice Dumplings or Zhong Zhi for sale. We were lucky to sample some and these were lovely! It was bursting with creamy black eyed peas and pork. I like the overall flavors and texture of the dumplings and they were bursting with loads of meat, chestnut, egg yolks and etc. *Rice Dumplings are Not part of the Groupon Deal. Overall, Zing has a class on its own! The ambience is really gorgeous for entertaining and the private rooms are so luxurious! The food has a refine Cantonese feel, plus you may even get to see the chef in action preparing your dish in their open kitchen stations! * Thanks to Grand Millennium and Groupon for the invite! Popeyes Louisiana Kitchen: Sticky Wicked Chicken - Stickaliciously Good! 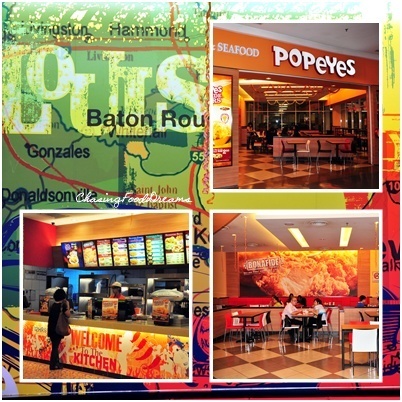 I had Popeyes when I was studying in US and was ecstatic when Popeyes arrived here. Named after a character in the then popular movie, The French Connection, owner Al Copeland founded the fast food chain in 1972 in New Orleans, Louisiana. Louisiana ambience with its signature orange colored theme, I like the spacious décor and its jazzy posters. When I found out Popeyes has just introduced a wicked chicken strips, I headed to one of the Popeyes’ outlet in The Curve to check out how wicked it was! Popeyes Sticky Wicked Chicken is thin strips of tender, juicy, all-white meat chicken marinated for at least 12 hours in authentic Louisiana seasonings, hand-battered and breaded in the restaurants, then freshly tossed in a special sweet and spicy sauce and is served up twisted, curly and wicked. First bite of this stickalicious chook was lovely. Crispy on the outside and meltingly tender in the inside, Sticky Wicked Chicken strips was lightly coated with a slightly sweet sauce which is quite similar to the Thai chili sauce. It’s actually quite addictive and the stickiness gives me an excuse to lick my fingers clean… yum! With this, Popeyes Louisiana Kitchen in Malaysia celebrates the arrival of the new Sticky Wicked Chicken by rewarding customers with a ‘Meal for 2’ promotion in which they could save up to 30%! For only RM20.60, patrons get to enjoy one box of Sticky Wicked Chicken, two pieces of Popeyes’ signature Bonafide Chicken, three pieces of Bonafide Chicken Tenders, two pieces of Popeyes signature biscuits, one large mash potato or coleslaw and two regular-sized cups of Ice Lemon Tea. If that’s not enough to satisfy your palate, the Sticky Wicked Chicken is also available ala carte at RM4.95. I also devoured their bestsellers like their all time signature Bonafide® chicken marinated in Louisiana Seasonings. I know why I keep returning to Popeyes… it’s their perfected fried chicken which is consistently juicy, crispy and golden flavors that seems to satisfy my soul. The size also matters as I can get full with a two piece and their irresistible sides. I read a few people commenting on the chicken here has less flavors compared to another giant chicken chain but I personally didn’t think so because I do like the clean flavors of Popeyes and I could actually taste the natural chicken flavors. It is also less oily in my opinion with a moist and tender meat inside the chicken. What I do adore about Popeyes Coleslaw is the chunky shredded cabbages and carrots. The textures lend a more homemade feel and since I am a big fan of pickles, I love that pickles is incorporated into the slaw. Mashed Potatoes are my all time favorite carbs. The mash here is pretty good as it has the creamy and smooth texture with Cajun brown gravy and minced meat. I usually do not take chili sauce for my fried chicken but instead dip it in the potato gravy which makes it even more succulent. 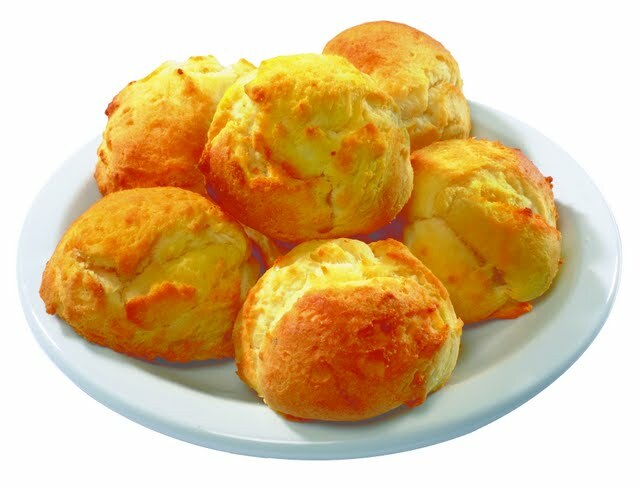 One thing that separates Popeyes from the other giant chicken chain is its signature southern Biscuits that comes with the meal. Malaysians may not be used to this biscuits which is a cross between a crumbly cookie and scones but I do quite like it. It has a soft, fluffy and crumbly texture and I use this to mop up the potato gravy again! Cajun Battered Fries are French fries fried till crisp with Cajun seasoning. Golden and slightly thicker than normal shoestring fries, this is another highly addictive side with a hint of spices undertone. Besides those, there is the Louisiana Tenders, which are boneless strips of fried chicken. These are lovely for those who detest bones! Fried Fish Fillets are also deep fried with their signature batter and its average for me. I would have to say it’s a little better than another giant fast food chain too because you can actually feel the flaky fish with the tartare sauce. Popcorn Shrimps, battered crispy shrimps in their signature batter, which are so easy to eat. I could probably have these as snacks in front of a tv… hehehe! I also sampled their Po´ Boy sandwich with Popcorn Shrimps. Simply scrumptious with hot fried crispy Popcorn Shrimps, lettuce, tomato and mayonnaise! Being a typical Asian, we got to have our rice. Popeyes also has a few rice dishes such as this Popcorn Shrimp Rice Bowl. Popcorn Shrimps crowned the rice and was dressed up with brown gravy. There is also a layer of mashed beans beneath the rice. Not too bad to get my rice fix! Desserts were minimal but I did enjoy the three desserts they offered. We had tiramisu, chocolate cheese and strawberry cheese in a cup. For that price, I just could not complain as it was quite nice with the chocolate being my favorite as it was rich and chocolatey. So don’t miss out on the new feel and taste of the Sticky Wicked Chicken, only available at Popeyes stores in Klang Valley located in Taman Tun Dr Ismail, Sunway Piramid, Mid Valley, Wangsa Walk, e@Curve, The Mines Shopping Fair and Jalan Yap Kwan Seng, open from 10.30am to 10.30pm. Log on to Popeyes Louisiana Kitchek Malaysia’s official facebook page at wwww.facebook.com/PopeyesMalaysia for more details and try out their brand new Sticky Wicked Chicken offered at a limited time only! *Thanks to Popeyes & Mei Anne for the scrumptious invite! Restaurant Woo Ng Kee: A Blast From The Past! MCY Restaurant: Dim Sum Obsession!